Contribution levels to multiemployer defined contribution plans have varied over the past decade, driven by changes to wage packages stemming from economic turmoil. On the other hand, aggregate disbursements have increased, driven by the retirement of maturing plan participants. In general, net cash flows have shown modest improvement over the past decade. Due to these shifts, as of 2015, the average account balance held steady at $36,500. 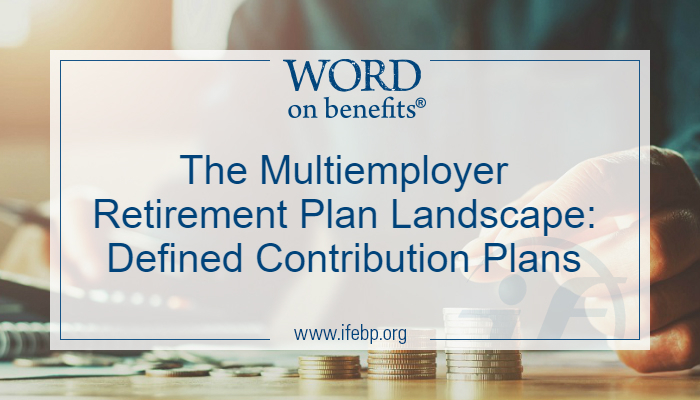 These are among the findings of The Multiemployer Retirement Plan Landscape: A Ten-Year Look (2006-2015), based on Form 5500 Annual Reports filed by 1,080 defined contribution (DC) plans filed with the U.S. Department of Labor. The total number of multiemployer DC plans decreased from 1,142 for the 2006 plan year to 1,080 for the 2015 plan year, with some slight annual fluctuations. Factors such as the establishment of new plans, mergers and plan terminations contributed to changes in the overall counts over this period. Of the DC plans in this study, 76.6% are in the construction industry, followed by transportation (6.6%), entertainment (4.4%), manufacturing (3.8%), retail and wholesale (3.2%), and service industries (1.9%). Geographically, 41.1% of the plans are located either in the Northeast or Mid-Atlantic regions, 30.6% are in the Midwest, 17.8% are in the West, and 10.5% are located in the South. Examined DC plans are divided into three broad types. About two in five (39.3%) indicated they are money purchase plans, which typically have fixed, rather than variable contributions. 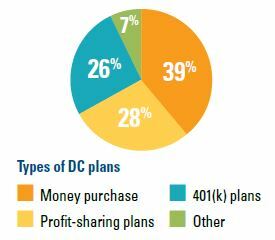 More than one in four (27.8%) indicated they are profit-sharing plans, followed by 401(k) plans (25.8%). The remaining 7.1% include target benefit plans, offset plans, 403(b) plans, or those that did not specify a plan type. An analysis determined that 81.9% of these plans are associated with a defined benefit (DB) plan, while 10.1% of the total are standalone in nature. The remaining 8.1% of plans are unknown. The asset levels of these plans were also evaluated. Focusing on larger plans, 4.4% have asset values of at least $500 million, 2.0% have assets of $1 billion or more, and 0.6% have assets of $2 billion or more. 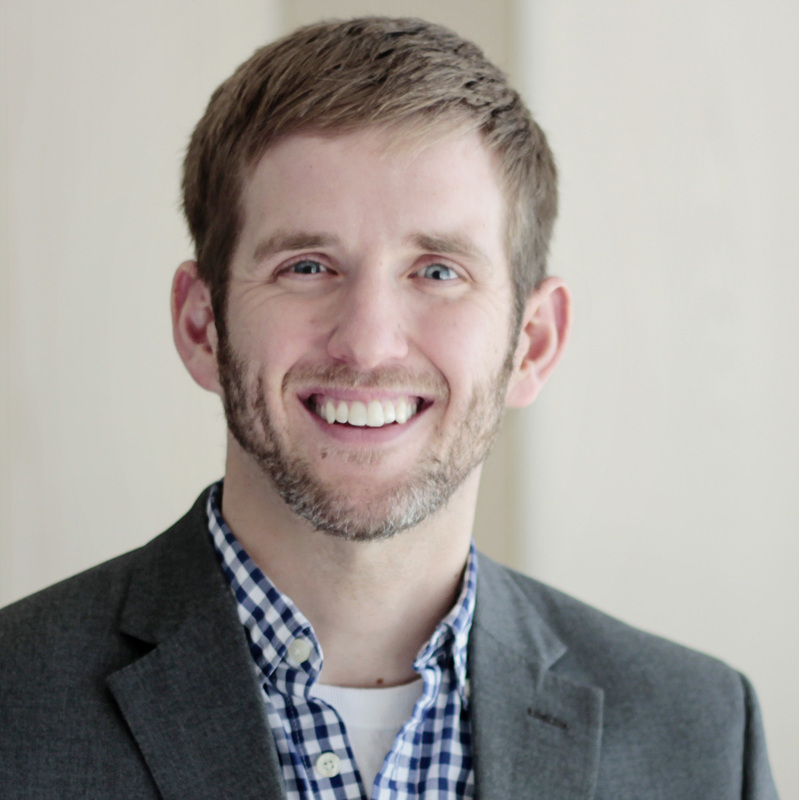 Focusing on medium-sized and smaller plans, 21.4% have assets of at least $100 million but less than $500 million. About three in four (74.2%) plans have assets of less than $100 million, while 58.9% of plans have assets of less than $50 million. The combined market value of assets of the 1,080 plans in the study is more than $130 billion. Plans vary similarly by their participant counts. The median number of plan participants is 1,178, while the average number of plan participants is 3,657. In total, the 1,080 plans in the study have more than 3.9 million covered participants and beneficiaries. An analysis of employment status found that roughly 75% of reported participants at the end of 2015 were actively working. The total number of active participants increased slightly over the decade covered by the study, from 2.81 million at the end of 2006 to 2.91 million at the end of 2015. Examining the employer level, 26.7% have fewer than 25 participating employers, while 51.3% have fewer than 50 employers. Fewer than one in three (31.2%) plans have at least 100 participating employers. The median number of participating employers is 48. Form 5500 figures captured both contributions (made by both employers and participants) and disbursements (benefits paid to participants and their beneficiaries). Aggregate contributions have varied over the past decade, increasing from $5.94 billion in 2006 to $7.32 billion in 2008, decreasing to $6.17 billion in 2010, and then increasing again to $8.90 billion in 2015. A number of factors may have driven the fluctuations, including changes to wage packages stemming from the economic turmoil during this period. 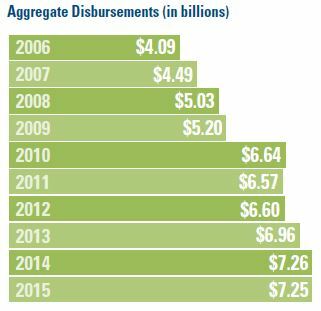 Aggregate disbursements have increased over the past decade, from $4.09 billion in 2006 to $7.25 billion in 2015. This trend is likely driven by maturing plan populations, with increasing numbers of participants taking their account balances upon retirement or termination of covered employment. In general, net cash flows have shown modest improvement over the past decade. Total net cash flow changed from a positive net cash flow of $1.86 billion in 2006 to a slightly negative net cash flow in 2010. Since then, net cash flows have become more positive, reaching a positive net cash flow of $1.65 billion in 2015. As of 2015, the median contribution per active participant was $2,971. One in seven (15.6%) plans had contributions per active participant of less than $1,000 for the latest plan year. Conversely, one in four (26.9%) plans had contributions per active participant of at least $5,000. Only 5.1% had contributions per active participant of $10,000 or more. The total increase in the median contribution per active participant over the covered decade varies significantly by industry. The study also compiled year-by-year returns of the identified calendar plans. The median returns were double-digit positive in four years: 16.9% in 2009, 10.3% in 2010, 10.2% in 2012, and 14.5% in 2013. However, returns were sharply negative in one year, -21.0% in 2008, and essentially flat in two years, 0.2% in 2011 and 0.0% in 2015. The median annualized return for this subset of 530 plans for the ten-year period from 2006 through 2015 is 4.77%. 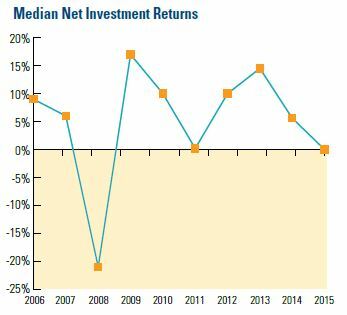 For comparison, the median annualized return for the prior ten-year period from 2005 through 2014 was 5.28%. One in six (16.7%) plans had an average account balance of less than $10,000, while 13.0% had average balances of $100,000 or more. The middle 70.3% of plans, had average account balances of at least $10,000 and less than $100,000. Nearly half of all plans (48.0%) had average account balances of at least $20,000 and less than $75,000. As of the end of the 2015 plan year, the average account balance for the median plan in all industries was about $36,500, with higher balances in the entertainment ($46,900) and construction ($40,900) industries. Average account balances were lower for median plans in the transportation ($26,000), manufacturing ($19,300), retail and wholesale ($9,200) and service ($8,800) industries. Access the full report to see the complete findings: The Multiemployer Retirement Plan Landscape: A Ten-Year Look (2006-2015).